What if Johnson Wins New Mexico (or Hands it to Trump)? Election News > What if Johnson Wins New Mexico (or Hands it to Trump)? While New Mexico has trended increasingly 'blue' in recent elections, a wild card could shake things up there this November. In a poll out Sunday, the Libertarian nominee (and former two-term governor of the state) Gary Johnson received 24% of the vote, not far behind the frontrunners, who were only separated by four points in the four-way match-up. When the only options were Clinton and Trump, Clinton's lead expanded to ten points. Looking at the polls where third parties are included, New Mexico is probably Johnson's best chance at winning a state. It also appears that his support in the state impacts Hillary Clinton much more than Donald Trump. This opens up at least the possibility of Trump winning the state, an outcome that would otherwise be highly unlikely. A strong, but not winning performance by Gary Johnson in New Mexico could also hand the state to Donald Trump. 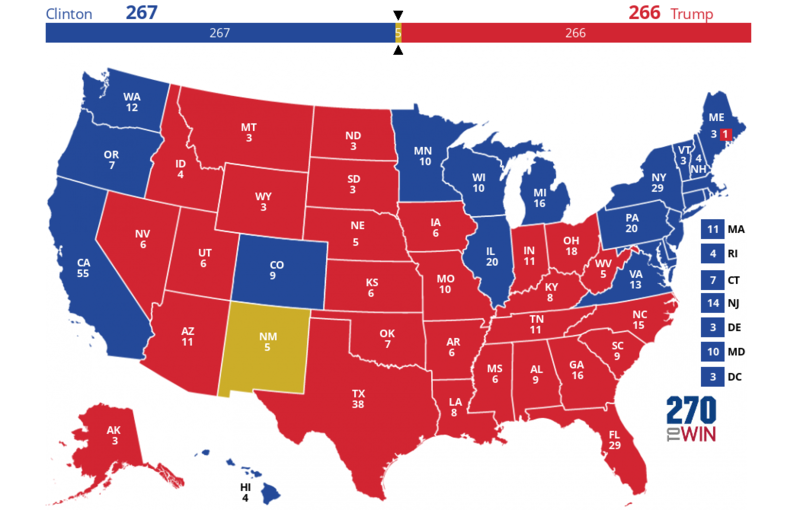 In the above scenario, that would give him 271 electoral votes and a win in November.